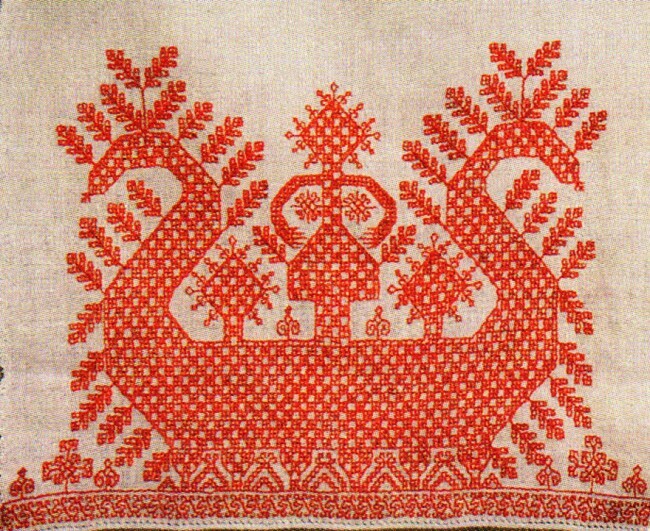 Traditional Russian embroidery intertwines itself closely with the history of Russia, or more precisely, the land that it now occupies. Seen as an ubiquitous folk tradition, it is, in fact, a diverse and multi-faceted skill that spread and evolved through centuries and over geographical borders, equally distinguishing and uniting people. 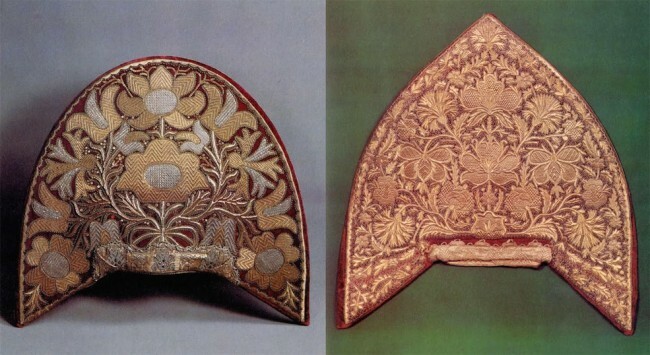 Several well-known styles of embroidery – for example, Krestetsky stitching or Christian gold embroidery – create but a fraction of various techniques, which were once used in households and for the most part forgotten after the 19th century. Of what has been preserved, it is generally acceptable to distinguish two groups of embroidery, originating in Northern and Central Russia, respectively. 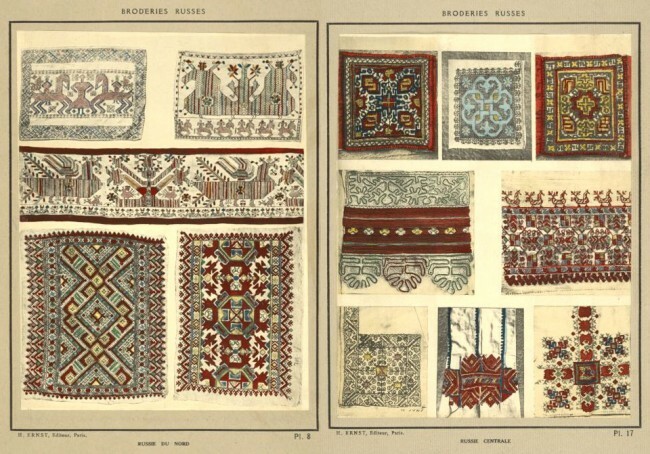 The embroidery of Northern Russia is marked by a vast use of geometrical patterns and a restricted colour scheme, with most of designs executed entirely in red. Reliance on red in needlework, particularly in backstitch and Holbein stich, is closely bound to the wide-spread acceptance of the colour as a symbol of beauty, and has long since surpassed the field of traditional embroidery. One of the most cherished embroidered images in Russia, “the Sun Chariot”, is traditionally rendered in red. 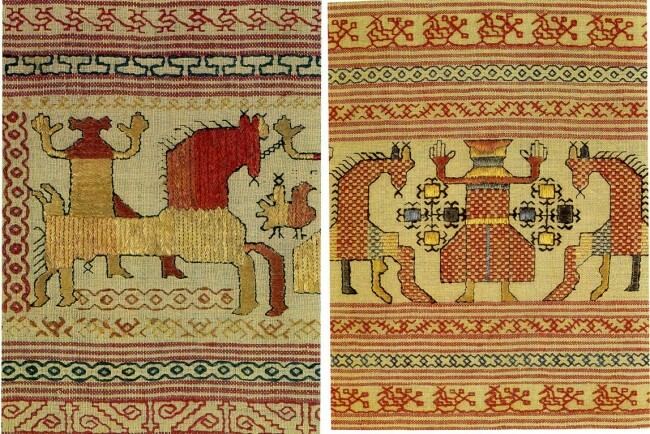 Another aspect of Northern Russian embroidery is a predominant use of horses and riders in patterns, which serve as proof of the land’s cultural and artistic links with Scandinavia, as far back as in pre-Christian and Viking times. 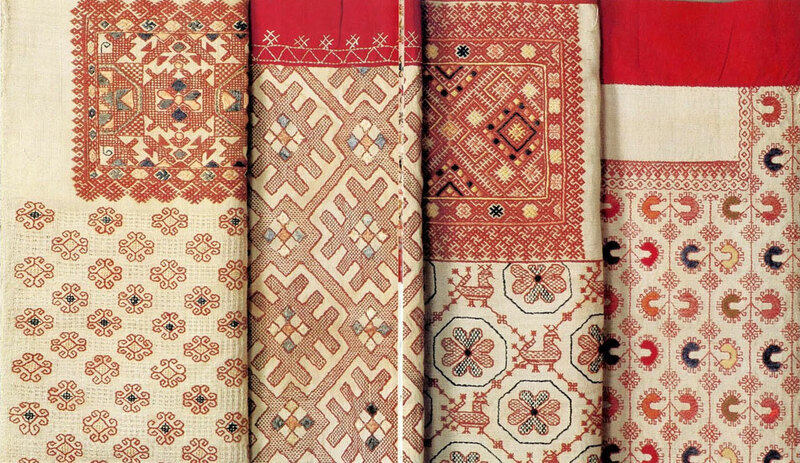 Those ornamental motifs show not only the skills of mainly peasant population of the land, but also their social and political dealings at the time. Not unlike its Northern counterpart, the embroidery of Central Russia reflects daily life and elements of nature that all once possessed symbolic meanings. Geometrized or fluid forms of plants, birds and animals, including that of a leopard with a raised paw, habitually appear in embroideries of various kind, for example, set stitch, counted satin stitch and herringbone stitch. What sets these embroideries apart is an abundance of colours and an unusual diversity of patterns used by lower and upper classes alike. Whether in costume or in daywear, embroideries display a complete natural colour palette and indicate surroundings and lifestyles of a different kind. 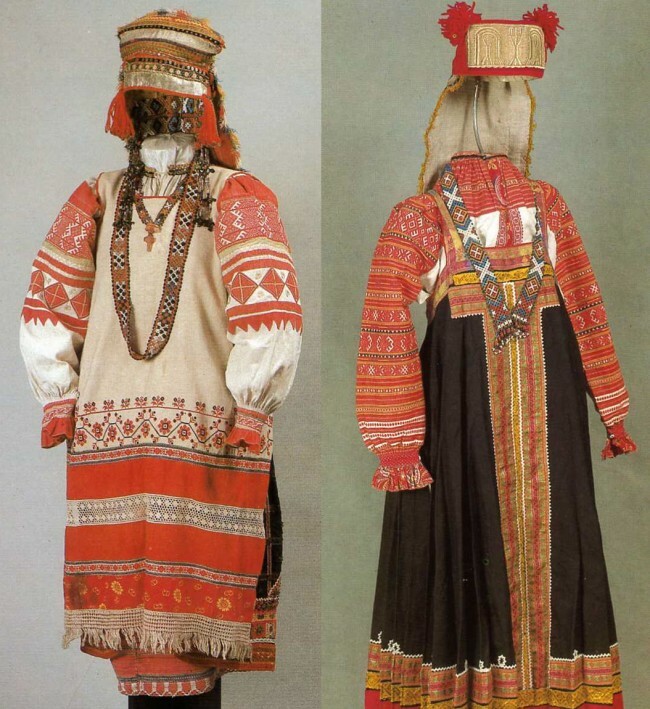 The importance of traditional Russian embroidery should not be underestimated in either Northern or Central Russia, for it undoubtedly played a substantial role in people’s everyday lives. 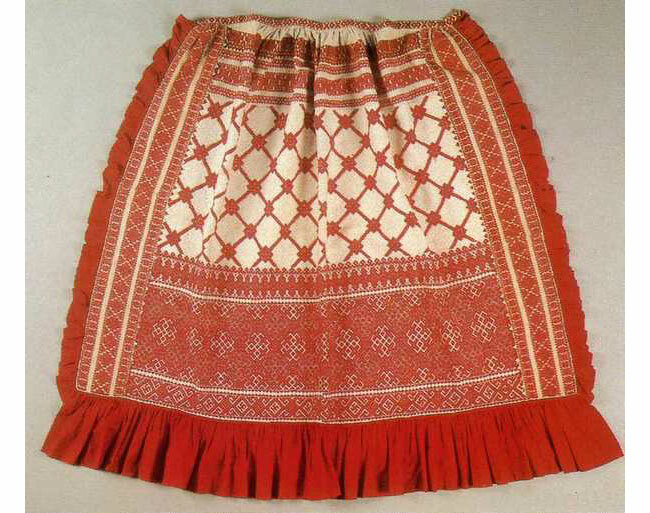 Much was domestically produced for home use and special occasions, with lower classes copying embroidery patterns worn by well-off families or developing their own. 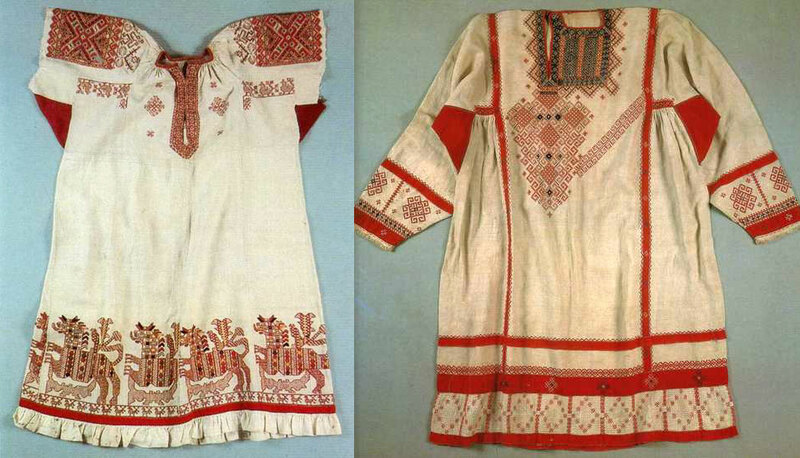 Linen clothes with embroidered hems and embellished towels were as much a part of daily life as a rite, and served to show skills of women in families as well as their social standing. Skillful embroideries were included in dowry and frequently went on to become a family treasure passed on from generation to generation, and some of these works survive even today. Do you think that Scandinavians had some kind of monopoly on horses? 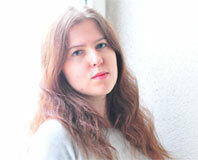 Horses are in fact more useful in the Southern steppes than in the North. The Vikings traveled not on horses, but on ships. 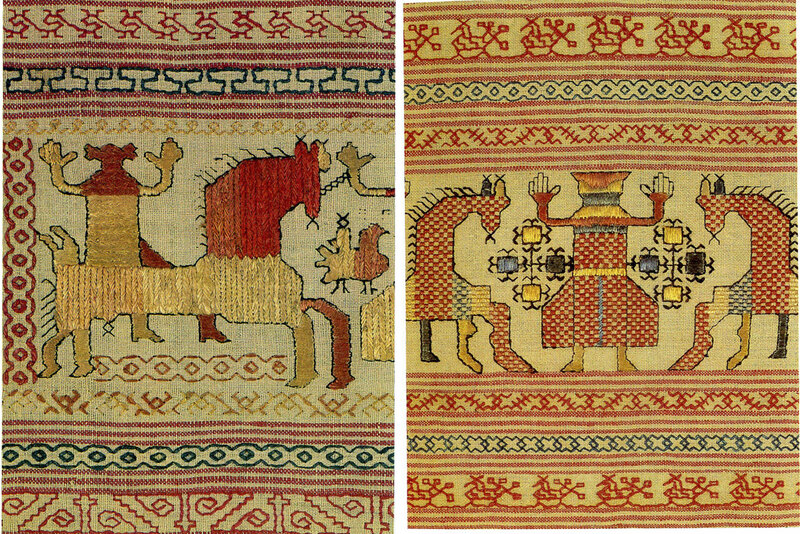 The fact that horses were used in Northern style embroidery has nothing to do with Scandinavian influences. You probably don’t realize how large Russia is, and I doubt that anybody from Southern steppes has ever reached its Northern part by horse.